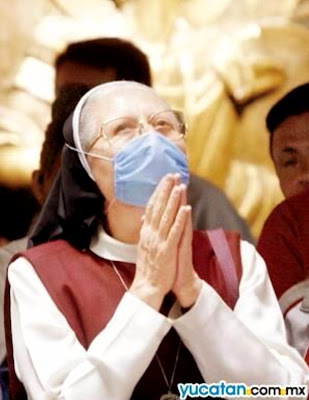 Swine Flu Update – Who To Believe? This morning’s Diario de Yucatan website states that there is one unconfirmed case of swine flu in the Yucatan. Great news, right? According to the story, they are awaiting the results of the tests from Mexico City. There’s no way to confirm this locally? Hmmm. This same website has another article that reports on the efforts being made on Yucatan’s state borders, where people driving in from other states are checked with state of the art equipment that measure body temperature with a laser device. If anyone shows a high body temperature, they are pulled aside to have more samples taken right there and the testing will show right there if the person is infected with the swine flu virus. The test takes… TWO MINUTES. This begs the obvious question: why, if the health authorities are able to detect the virus at a mobile lab set up on the highway in Coba, are they saying they need to wait for confirmation from Mexico City to determine whether or not the Merida case is positive? I would humbly suggest they send the sample to the Coba mobile highway lab and test it there – seems it would be a lot faster and more efficient, no? Meanwhile, the federal government, in an update on the news, shows a list of states that have the infection – Yucatan is among them. Meanwhile the malls are officially closed until May 6. But they are open, for the most part. So they are closed and open at the same time. And those people who organized a party on Facebook which was broken up by the Health Police are, according to some sources 6 years in prison and/or fines. Talk about your overreactions. Who to believe? Is there any wonder people are praying? In that occasionally infuriating way Mexico operates that brings out the neurotic foreigner in me, it turns out that the Gran Plaza mall is open this morning. A call to their administrative office reveals that the order from the manager/administrator is that ‘the mall opens’. This in spite of the ‘official’ statement yesterday saying that Merida malls would be close until May 6th. And you wonder why Mexicans are so cynical about anything ‘official’. Kukis by Maru will open shortly, I expect. How long will this last? Who knows! In the land of the unexpected and the Kafka-esque, ANYthing can happen! Maybe someone will sneeze and the mall will close. Just a quick note to let anyone not aware of the latest local developments regarding the swine flu hysteria that the authorities have decided in their infinite wisdom to close the malls as of this afternoon and apparently until May 6 or such time as it is determined ‘safe’ to do so. Wouldn’t want anyone to get a runny nose now, would we? This is another nail in the coffin of the local, state and national economy. WHo stands to gain, I wonder, by propagating all this ridiculous hysteria? It’s not Ebola for chrissake. IT’s A FLU people!!! Soon they will close the beaches as a lot of people are going there since it is the only thing left to do in this scorching, dead city. Here is the latest update as of this moment on the World Health Organizations website. As a result of Uxmal being closed due to the mass hysteria surrounding the latest flu epidemic, the Casual Restaurant Critic and the JF Crew visiting from Montreal, Canada found themselves in Campeche. Visiting museums and forts was, of course off limits since the INAH has closed historical sites countrywide, so after a stroll through the restored historical center and the impressive but very windy malecon (boardwalk) it was decided that a seafood dinner was in order. Where better to have seafood than at what is probably the best-known of the great seafood restaurants in Campeche, La Pigua. Arriving at around 6:30-7:00 pm, the restaurant looked deserted; no lights and no cars out front. Mrs. JF jumped out of the car to see if they were open and oh surprise, they were! Everyone got out and went inside. The Casual Restaurant Critic commented to the waiter going in, that perhaps they turn on a light or something to indicate that they were open since the place looked closed from the outside. The waiter replied that no, they were indeed open. Thinking maybe he didn’t quite get it, the Critic again suggested a light; no, the waiter said, they were open. Things were very slow that day, remarked the waiter; only 3 tables so far, as the Critic and each member of the JF crew were given a squirt of hand sanitizer by the hostess as a welcoming treat. Gone are the days of the welcoming cocktail; in this age of swine flu hysteria, the hand sanitizer squirt is the new welcoming gesture! Inside, La Pigua has completely changed. The Critic seems to recall that it was a palapa – kind of affair, but now it is completely modern, air conditioned and minimalist. Subdued lighting and dark colors make it very elegant indeed. Gone are the photos of celebrities who have dined here, which the Critic thinks was a nice touch and spoke volumes about the restaurants’ appeal. Oh well. Such is progress. The food, as usual, was superb. Coconut shrimp, seafoood antipasto, seafood soup, caviar Campechano, garlic shrimp and the Critics’ favorite: Calamares Sir Francis Drake, fresh calamari (squid) cooked simply with olive oil, toasted almonds and chile de arbol. What was really not so good, and bordered on terrible, was the service and the time it took for everything to get to the table. The Critic should add that there were a total of 3 tables occupied at this point. Drinks took a while (and it was beer, cheladas, refrescos, nothing complicated) and then the appetizers came; first the caviar Campechano, then about 5-8 minutes later, the seafood soup and the seafood antipasto. What followed was an interminable wait for the main course, during which the waiters had to be called over to get a refill on drinks. Each time the waiter appeared with anything for the group (4 people) he asked who it was for. Somehow there was no method for the wait staff to remember who ordered what. When the dinner plates finally arrived, the waiter again asked who ordered what in the way they do, saying the name of the dish with a question mark at the end so you can raise your hand and say ‘oh that’s for me’. Ladies are not served first and glasses and plates take a while to be cleared away. The icing on the cake was the end of the meal, when the two males in the party ordered espresso and everyone ordered some dessert (3 coconut cake, one flan). There are few dessert options and when the Critic asked which was the best, the waiter (not the same one that took the food order but he was in the area and got called over) shrugged and said they are all good. So the Critic asked which is YOUR favorite, hoping to elicit some enthusiastic response and to give him the opportunity to show off his salesmanship, he replied simply ‘the coconut cake’. The coconut cake took at least 10 minutes or more to arrive. It was of course, excellent, but in the meantime the conversation around the table revolved around the possible reasons it was taking so long. Maybe they went to San Crisanto (in Yucatan) to harvest the coconuts. They were baking it. You get the idea. All in all, it was a very good meal but the service was embarassingly bad. There are worse restaurants, the Critic knows. But for a restaurant of this calibre and fame, to have such shoddy service is imperdonable; especially considering that La Pigua in Merida has far superior service. It is like the waiters here, while friendly enough and dressed handsomely in white shirts and black vests, were all stoned or taking Valium, much like the one at Villas Arqueologicas Uxmal some time ago. Next time, the Critic will try something new; there must be a hundred seafood options in Campeche.